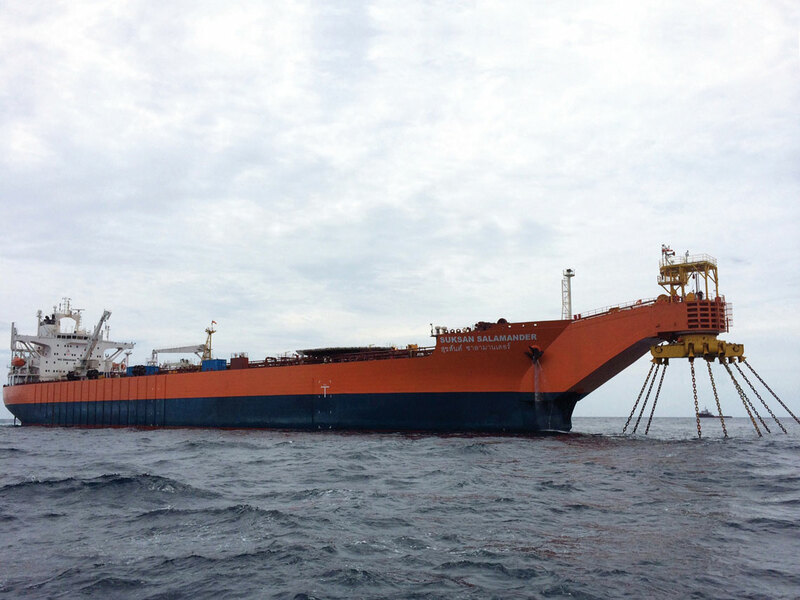 Bualuang started loading oil on 14th August 2014. LMC designed the cantilever turret mooring system and handled all the procurement and construction for the FSO, on time and on budget. The turret was integrated to the vessel “Saksan Salamander” FSO and sailed to Bualuang Field in July of 2014. The mooring installation was successfully completed with the hook-up phase lasting little more than 24 hours and tensioning phase for another five days, this representing a very fast offshore mooring installation. It was then followed by riser hook-up and commissioning. Two flexible risers were installed between the turret chain table and the Bualuang Bravo Platform. Once connected at both ends, risers were pressure tested and leak tested. These operations were all successful and allowed for startup to take place.